What can you do with a can? You can kick it. You can recycle it. 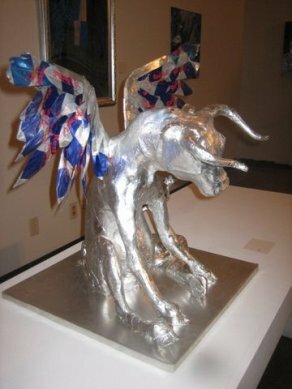 Or, if you were one of the hundreds of artists who submitted entries to theRed Bull “Art of Can” competition at the Galleria this summer, you could turn thousands of those iconic silver and blue cans into flying fish, tight-fitting bustiers, butting bulls, rings, earrings and evening dresses. Guest blogger Gail Sachson owns Ask Me About Art, offering lectures, tours, program planning and consultation. She is Vice-Chair of the Cultural Affairs Commission and a member of the Public Art Committee. What can you do with a can? You can kick it. You can recycle it. 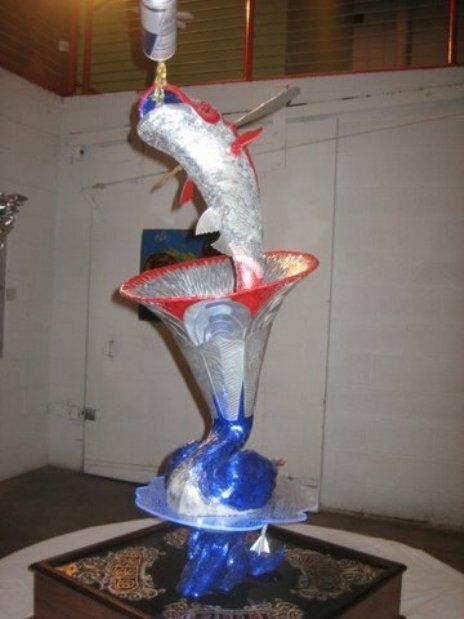 Or, if you were one of the hundreds of artists who submitted entries to the Red Bull “Art of Can” competition at the Galleria this summer, you could turn thousands of those iconic silver and blue cans into flying fish, tight-fitting bustiers, butting bulls, rings, earrings and evening dresses. Since 2000, artists all over the world have suffered nicks, scrapes and scratches to bend and beat the metal cans into submission to an artistic vision. Several entries were from UNT fashion design students, so it was no surprise to see can-made, hand-made gowns, hat mannequins encrusted with cut cans, flowers and feathers. I was delighted to be one of the six judges, who toiled over which of the 60-plus accepted entries were to be exhibited and which would win first-, second- and third-place prizes. The first-prize winner will receive some Red Bull, I’m sure, and two tickets to Art Basel, Switzerland. The second prize winner will win two tickets to Art Basel, Miami, and the third, a “customized local art experience” to be determined. Also yet unannounced are the names of the exhibitors or the winners. We’ll have to wait until the show, which runs July 31-August 22 in a specially designed space in the mall. 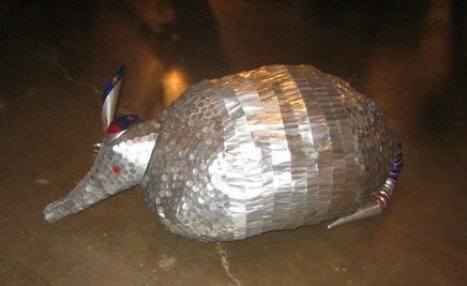 I am hopeful that one of my favorite entries – a remote controlled, battery powered, can-covered armadillo – will be scurrying across the path of determined shoppers, who will delight in the forced detour. When and where is Red Bull Art of Can 2011 and info to enter the competition?